This is the second part about Korean Air's North American market, its largest long-haul segment. Korean Air expanded across the trans-Pacific over the past decade and has become relatively mature. Now as competitors grow and face some time to settle in to their markets, Korean Air is aiming to boost profitability, which competitors will turn to later. 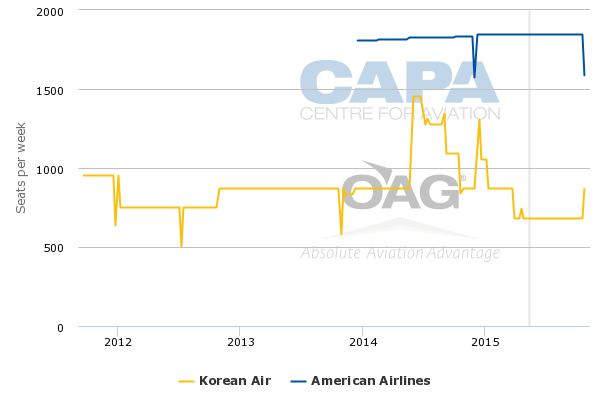 Korean Air has been seeing yield growth, and VP Americas John Jackson said at CAPA’s Americas Aviation Summit: "We're not the low fare carrier" across the Pacific. New premium products were probably over-due, and Korean Air's first direct aisle access business class seats should be welcomed by the market. US-Latin America fifth freedom opportunities – particularly a Los Angeles-Lima flight – will not be launched as Korean Air is in this conservative period. Its existing Los Angeles-Sao Paulo service is facing competition from American Airlines. The market may be too small for both. This is greatly over-shadowed by the opportunity from a potential joint-venture with quasi-partner, quasi-foe Delta Air Lines. Mr Jackson sees the Delta relationship improving with the potential to tie the knot: "There's too much at stake and to be realised." Korean Air's size gives it leverage, and Mr Jackson says "We don't have to take the first offer." Earlier in 2015 Korean Air announced new premium products for its first and business class. First gets a new enclosed suite. The biggest change is to business class, where every seat will be lie-flat and have direct aisle access for the first time. This is a large improvement compared to the 2-3-2 configuration in business class on its long-haul 777s. Korean Air is using a B/E Aerospace seat already flying with Oman Air and JAL. The seat will enable Korean Air to maintain a 2-3-2 configuration (perhaps with reduced rows) on its 777s as the seats are partially enclosed and have an exterior mini horizontal aisle to gain access to the main vertical aisle. Korean Air has so far only announced the product for new delivery aircraft, but it can be assumed a retrofit programme is in the works given the shifts in business class seating and the vast difference between Korean's old and new business product. Mr Jackson says Korean Air last updated its premium products five years ago and this was update was agreed "after persistent market demand" where not having "all aisle access was a weakness". There is invariably some loss of density that may not be made up for with higher yields. This excludes the large retrofit overhead costs. Mr Jackson says Korean Air will need to observe yield trends. At the end of the day, however, airlines are finding more spacious premium seats are a competitive necessity. Korean Air's North American network includes two fifth free routes: Tokyo Narita-Honolulu and Los Angeles-Sao Paulo. Korean Air began Los Angeles-Sao Paulo service in 2008, re-opening the route since Varig's exit in 2006. Delta very briefly served the market in 2009 and 2010, but has mostly had a monopoly on the non-stop pairing. Korean Air in 2014 offered the service three times weekly during off-peak periods, four times weekly in the shoulder seasons and five times weekly in peak periods. However, so far in 2015 Korean Air plans to maintain service at three weekly. Korean Air has transitioned the route from 777-200 to 777-300ER and now the smaller A330-200. In 2013 American Airlines won the right to operate a service from Los Angeles to Sao Paulo and commenced the flight later that year. American has a daily 777-200 service. Since American's entry, Mr Jackson said the Los Angeles-Sao Paulo "market may not have grown that big enough for two" carriers. Mr Jackson says about half of Korean Air's passengers on the Los Angeles-Sao Paulo sector are local traffic. Of the other half, almost all are Korean. Connections from China and Japan are very small: although there are volumes of traffic from China to Brazil, Korean Air has found the yields too low. Korean Air in Nov-2012 said it planned to open in May-2013 a second Latin American destination, Lima, to also be served via Los Angeles. Korean Air saw the high yields from LAN, the route's only operator, and saw opportunity to again combine connecting and local traffic. However, as part of Korean Air's shift from growth to profitability, Lima plans were suspended. 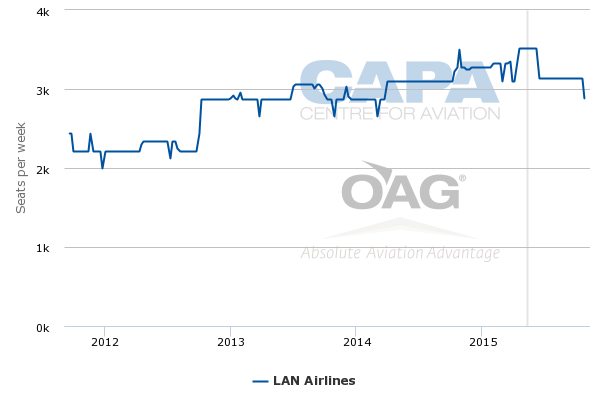 LAN increased Los Angeles-Lima in late 2012 and again in late 2014, growing about 50% over two years. Korean Air has rights to operate from Japan to the US, but these are limited and Korean Air cannot for example operate between Tokyo and New York. Korean Air operated between Tokyo Narita and Los Angeles, mostly with a daily service, until early 2013. Korean Air only had seven weekly fifth freedom frequencies and re-allocated them to Tokyo Narita-Honolulu, catering to Japanese going on holiday in Hawaii. That market has since been pressured with the yen's depreciation. Mr Jackson noted Korean Air holds the right for four weekly China-US services but exercising those "is not something we want to do", he says. Perhaps the biggest near future strategic change for Korean Air is a possible partnership – even joint-venture – with Delta Air Lines. Although the two are members of SkyTeam, the Korean-Delta relationship has been one of the most sour in any alliance. It was Delta that cancelled the codeshares with Korean Air, Mr Jackson says. Delta also no longer allowed its frequent flyers to accumulate elite qualifying miles when flying on Korean Air-coded flights, a move likely designed to keep Delta's members on Delta-coded flights. There are many theories on the cause of the relationship's decline, and Mr Jackson declines to go into history. Probably the most logical explanation however is Korean Air's sheer size across the Pacific and its ability to tap into the China-US sixth freedom market. Delta believes the share of sixth freedom traffic in that market is disproportionately high compared to its calculated world average. In the China-US market, however, Chinese and US carriers sat out from growth for a long term, leaving an opportunity for the likes of Korean Air. Mr Jackson acknowledges Korean Air has suffered an impact to its business from the decline in the Delta relationship, but believes Korean Air's longer market presence and scale allowed it to withstand the impact better than if the relationship decline had occurred with a smaller and younger trans-Pacific carrier. Although the public facing elements of the relationship are unchanged, Mr Jackson thinks there has been change in outlook between the managements. "There's too much at stake and to be realised," Mr Jackon says. This would be unlikely to produce a return to the status quo. Rather the outcome would likely be a stronger partnership than before, and even a joint venture. Many see Delta's actions as retaliation and a way to force Korean Air into a joint-venture. "It's no secret people think Delta is 'my way or the highway'," Mr Jackson says. Korean Air has been watching Delta's Asian growth. While Delta's capacity numbers may indicate size, Korean Air is aware of the strength it brings for onward Asian points, especially in China. Most of these points will not receive direct US service in the foreseeable future, giving an advantage to those who hub to them. "We don't have to take the first offer," Mr Jackson says. A wild card is Korean Air seeking other partnerships if the Delta relationship cannot be addressed. Korean Air and American in Feb-2015 announced a limited partnership under which Korean Air placed its code on American's Dallas-Seoul Incheon service. American did not place its code on Korean Air's flight on that route or any other. American serves the route daily but Korean Air is only five weekly. Each airline also gained access to beyond points (via interline): for American, secondary cities in mainland China via Seoul Incheon and for Korean Air, domestic and Latin American points via Dallas. Although some have said it was Korean Air that approached American, Mr Jackson thought it was more of a mutual deal or even weighted towards American, which does not have a mainland Chinese alliance partner (but does partner with Hainan). Much was said of Korean Air "crossing alliance lines" to partner with American, but Korean Air did not have many opportunities within SkyTeam to grow its virtual North American network. "One of the issues we always had was our network wasn't the best fit with Delta," Mr Jackson says. Korean Air's serves Delta's main hub at Atlanta and newly growing Seattle hub. But other Korean Air destinations see a more limited presence from Delta, or have stronger local carriers. Although not addressed, foreign carriers are increasingly finding US network carriers (American, Delta and United) charging high beyond gateway fares in order to favour their own long-haul flights. A JV would presumably reduce that occurrence. Another factor at play between Korean Air and Delta is Seoul Incheon trying to woo Delta for an expanded presence at Seoul Incheon, essentially asking for Delta to move its Asian hub at Tokyo Narita to Incheon. Delta has raised this matter, not in much depth publicly, but Incheon's CEO was to meet with Delta CEO Richard Anderson in Dec-2014, according to the Korea Herald. Incheon not only wants a gain in passenger numbers but an increase in transfer traffic. Delta is unlikely to bite without a Korean Air deal. But should one eventuate between Delta and Korean Air, Delta it seems will have an anxious Incheon ready to do business. In May-2015 Delta and Korean account for approximately 59% of the US-Korea market, split between 51% for Korean Air and 8% for Delta. An expanded partnership would likely see Delta add more capacity into Incheon. Further, the potential size of the JV will depend what other markets can be included in the partnership: other trans-pacific JVs have been able to include Singapore and Hong Kong but not mainland China. Outlook: Korean Air has a large network to work with. If not Delta, what is plan B? Korean Air has the luxury to think about strategic growth instead of large capacity increases, as other trans-Pacific carriers are doing. 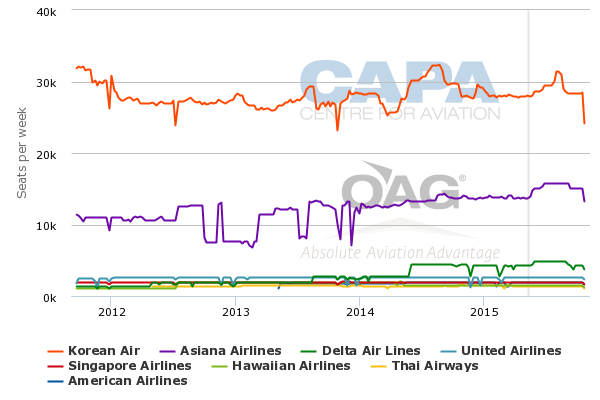 It – and Delta – lag American/JAL and United/ANA in having trans-Pacific JVs. But with Japanese carriers having some of the highest costs in Asia, and the trend is for US carriers to reduce focus on Japan, these alliances will progressively become less valuable. Korean Air, with its existing large trans-Pacific network and favourable cost base, is coupled with Korea's growing economy/population and successful marketing of culture. That combination allows Korean Air to offer a larger network and clear platform for growth across Asia's many markets. Unfortunately for Delta, Korean Air moved earlier and faster. As global alliances loosen, restrictions and independent airlines gain size in prominent locations (Alaska Airlines, JetBlue and Virgin America), Korean Air is not so dependent on a Big US partner. Delta might be the preferred option, but its years of JV experience – it did aviation first, Northwest-KLM – means it is experienced in ensuring the deal is in its favour. The Pacific is some time away from being like the Atlantic where capacity is largely stitched up between three JV group players. Outside the partnership arena, Korean Air's premium product upgrades will be much appreciated. While they could have occurred earlier, Korean Air is certainly not the last to meet the new standard. There is inevitably some impact to trans-Pacific growth from slow liberalisation, especially with China, where Korea's airlines have been disappointed by the limited rights (often only to smaller cities) granted in recent times. Fifth freedom, although interesting and sometimes controversial, is relatively just a blip. Korean Air has been a quiet achiever. Its outlook between North America and Asia is bright. Even if airlines from other markets are growing, Incheon hub has the geography, cost point, infrastructure and passenger appeal that many other hubs lack. As Korean Air becomes perhaps the first to mature across the Pacific, its next phase of growth could be a bellwether for what is to come. It is an interesting development at a time when so many other carriers are focussing on sheer size growth.